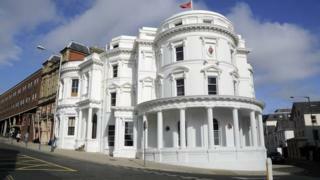 The Isle of Man has said it does not welcome those "seeking to evade or aggressively avoid taxes", following the Paradise Papers revelations. Its tax practices have come under scrutiny after documents showed Formula 1 champion Lewis Hamilton avoided tax on his The UK Treasury is now investigating the importation of jets to the island. On Monday, the BBC's Panorama programme said Hamilton was given a ?3.3m VAT refund after he imported a Bombardier Challenger 605 into the Isle of Man. While the 32-year-old F1 driver's planned use of the jet was predominantly for business purposes, the programme saw documents which suggested he intended to make private flights about a third of the time - with his social media accounts showing evidence of this. To try and get round EU and UK rules banning VAT refunds on aircraft used by private individuals, Hamilton's advisers formed a VAT-registered leasing business on the Isle of Man, the leaked documents held by offshore law firm Appleby suggest. The jet was then leased back to Hamilton. Paradise Papers: How Lewis Hamilton got a Mr Quayle confirmed that the assessment had begun, with the "scoping" of it due to be published this month and work to be completed in 2018. "The VAT treatment of the importation of aircraft into the EU is a highly technical and complex area in which the Isle of Man follows the same policy, laws and rules as the United Kingdom," he said. "However, we acted swiftly and decisively and have taken action to demonstrate that the Isle of Man is a well-regulated, open and transparent member of the international community." Panorama also raised questions regarding the European Savings Directive (EUSD) - a law passed by the Isle of Man government in 2005.The EUSD was introduced to stop people from one part of Europe putting assets in an account in another country without declaring it. Most of the people targeted by EUSD were therefore already evading tax. The law was changed seven months later, amid an EU clampdown.Tax adviser Mark Morris claimed an Isle of Man regulator was aware the new law would help tax evaders. Mr Quayle said the law was never utilised on the island and tried to distance his administration from the decision to enact it. "It is difficult for any administration today to understand or attempt to justify the thinking made by an administration nearly 13 years ago," he said. "We are considering all the allegations made to determine next steps and what action can be taken in relation to the past. "Mr Quayle added that "where the Isle of Man's integrity is challenged we will not be complacent", and he was "proud of the role" the island had taken "in moving the international tax agenda forward". "However it cannot - and should not - be overlooked that to truly combat evasion and abuse, action not only needs to be global but it also needs to be implemented consistently and effectively."